Hey there! I’m participating in this blog hop for the first International Author’s Day, a nice initiative by http://www.b00kr3vi3ws.in/. It would have been nice to have a giveaway for this occasion, but none of my stories are ready to be published as of yet, except the one for the Love’s Landscape event of the MM Romance Goodreads discussion group. I already posted the first chapter here. What I can do is offer the first person to comment on this post a pdf version of the whole story so you can be the first person to read it before it’s posted live – which should be soon, it’s already in the final stages of formatting. I got a cover and everything. Yay! I only started writing seriously a few months ago, I’m a shy writer who reads a lot! Which is to say, it’s not inspiration that’s lacking. I’ve been reading since I was around 6 – anything I could get my hands on, from milk cartons to my dad’s Times magazine – and then it became an addiction in my teens, for which I have never sought treatment nor do I have the wish to overcome it. It’s hard budget-wise but there are so many great free reads or cheap books out there – I’m not talking about pirating which I frown upon – that I don’t need lots of money since the invention of the e-reader tablet. My inspiration lately comes from Josh Lanyon, Kaje Harper and Kyle Adams. The first for his beautiful prose, the second for her way of evoking emotions in the most sincere, simple way and the third because, well, Kyle Adams is the funniest gay erotica writer I’ve ever read. If I could just write something that incorporates a bit of each of those three authors, I can die happy, but I don’t have much hope of ever writing at their level. Apparently, writing needs to be practiced, like a sport training muscle, so you never know. 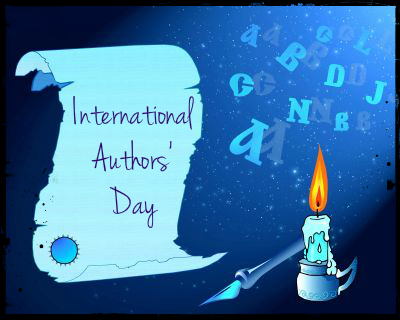 So Happy International Author’s Day everyone! And read in peace. Thank You for joining in the celebrations for #IAD! Never Cry Wolf sounds intriguing. Thanks for sharing Chapter 1 and thanks for the great giveaway. You can find it here: http://www.mmromancegroup.com/never-cry-wolf-by-phoebe-sean/ I’m sorry, I wasn’t allowed to send it before its posting on the website. The downloads will be available soon and you can download it either in epub, pdf or mobi. Thanks for your patience! Phoebe Sean on My story’s published! Liz G. on My story’s published!